Burma is changing rapidly, making guidebooks obsolete by the time they are published. The most up-to-date information comes from other travellers and their blogs. I travelled in Burma from late December 2013 to mid-January 2014, and here is my small contribution. Everyone needs a visa to enter Burma. You can stay in the country for up to 28 days (including the day of arrival and departure) with a tourist visa. Have your Myanmar visa completed before your holiday by using an e-visa service, or get it at the Myanmar embassy of your home country. Most men chew a betel nut mixture, which colours their teeth and lips a bright red. This can be a little unsettling at first. The constant sound of throat clearing and spitting the red stuff is something most visitors could do without. The women apply a pale yellow paste (from the tanaka root) to their face to act as a moisturizer and sunscreen. They also use it to make patterns on their cheeks and forehead, for aesthetic purposes. A few younger men also use the tanaka paste. The vast majority of Burmese speak little English, although not any less than their Thai neighbour, who has had decades of exposure to mass tourism. Large cities such as Yangon and Mandalay are busy, noisy and dirty, and remind me a little of India. Mandalay is charmless, while Yangon has a few interesting sites, such as the Shwedagon Pagoda, Bogyoke Aung San Market, and several colonial buildings from the British era. Yangon also has some traffic lights which makes crossing streets a lot easier than in Mandalay. Favourite places for most visitors remain small towns and the countryside, such as Kalaw, Inle Lake with its floating villages, and the Bagan area with thousands of ancient temples and pagodas. Another increasingly popular area is north of Mandalay, through the hill station of Pyin-U-Lwin and the town of Hsipaw. Some people also travel south of Yangon to Bago and Mount Kyaiktiyo (Golden Rock) as well as Ngapali beach on the West Coast. The dry season (November to February) is when most people visit. It can get surprisingly cold in the north and at altitude. Kalaw, at 1320 metres, experiences near-freezing temperatures at night. By mid-day the hot sun has warmed the air to the mid-20C. And then in the evening it quickly dips down to around 10C. Be prepared. Even Nyaungshwe (Inle Lake) and Bagan experience cool mornings in January. The price of accommodation has doubled and tripled in recent years, and in the most touristy places, such as Bagan, you now get poor value for money. 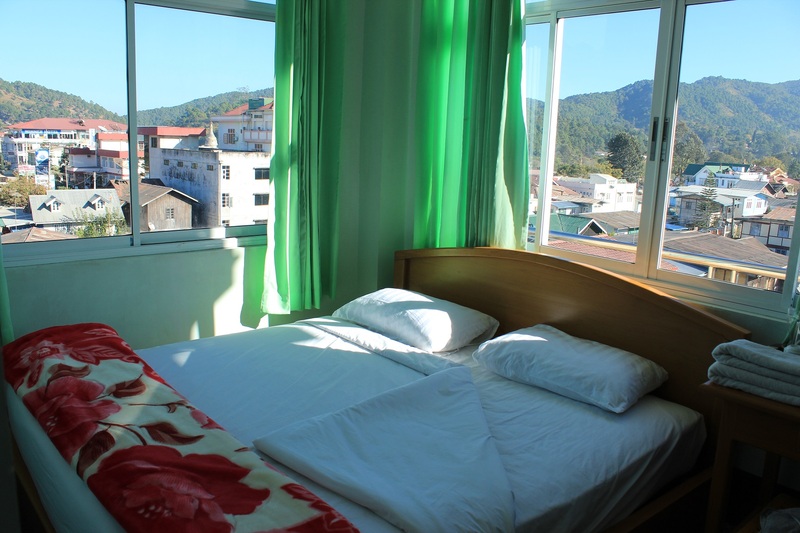 A budget room, with basic bathroom (and hot water), not too far from the centre of town, costs between $20 and $30. These prices include breakfast. Standards of cleanliness are lower than what you might expect. You are often required to ask to have your room “cleaned” and even then, don’t expect much more than having the bed made, a change of towels, and your trash emptied. Yangon: Ocean Pearl Inn 2 (also called Aung Si Guesthouse), No.100, Bo Gyoke Aung Sun Street, Pazundaung Tsp . Tel: 01 299 874. You can book this one through their web site and they respond quickly. There are now plenty of restaurants at the most popular tourist sites. One exception is Mandalay, which offers cheap draught beer, but mediocre food in the downtown area. 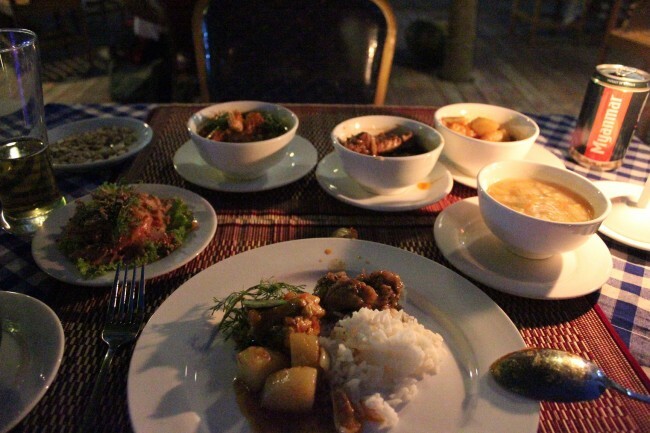 Nyaungshwe offers all sorts of foreign cuisines such as Italian, Japanese, Chinese, and Thai. Nyaung-U (Bagan) offers nice Burmese curries. And in Yangon, you can find pretty much anything, from market stalls to A/C restaurants with a Western menu. Food is cheap, except if you insist on eating Western food like burgers. You can have a meal (including a drink) for $3-$5. Finding good coffee is difficult. Read A coffee drinker in Burma for some recommendations. If you like wine, don’t miss the Red Mountain Winery near Nyaungshwe. You can get there from town in 20-25 minutes with a bicycle. Tasting of four wines costs $2.50. There are great views from the property. Transportation has improved a lot recently. You can take VIP buses on long distances at night, or at least comfortable A/C buses. JJ Express is one company that runs buses from Yangon to Kalaw/Inle Lake, and Mandalay in first-class comfort with large reclining seats and hostess service. On short distances, such as Kalaw to Shwe Nyaung (for Inle Lake) you may still find yourself in sardine can buses. Even the most expensive buses do not cost much more then $10-$15 for long distances. Buying your bus ticket the previous day should guarantee you a seat, even on the fancier buses, but if you want to pick a specific seat (window, or front of bus) you may want to buy as soon as you know your date. Even the best highways are bumpy, so if you are prone to motion sickness, don’t forget to take your preferred medication every time you ride a bus. Trains operate on some sections. Although I didn’t take them myself, I heard that they are slow, shaky, and often run late, but may be worth it for the experience. 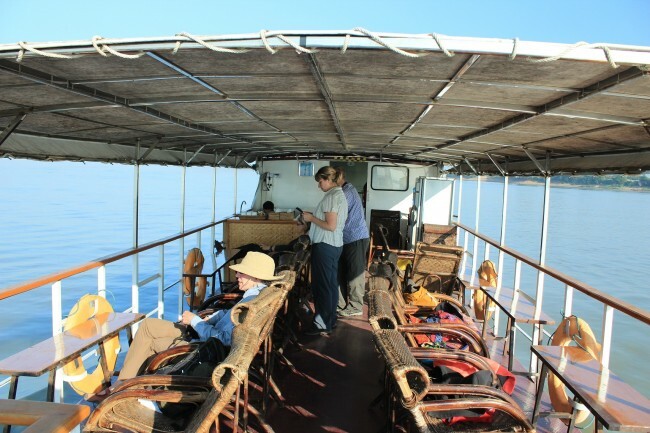 Taking the boat between Mandalay and Bagan (or vice versa) is a pricier but very pleasant way to spend a day. Several companies operate the route, take 10-12 hours and cost $35. MGRG Express includes breakfast, lunch, and water in the price, while the other operators only include breakfast. Short distance rides in taxis, songthaews, horse carts, etc. need to be negotiated. Drivers are not too aggressive (yet) and there is plenty of competition, so you can take your pick. Advertised day tours that take you to see Inle Lake, the sights around Mandalay, or a horse-cart tour of Bagan include the vehicle and the driver, but not guide services. The driver speaks very little English, and you are left to yourself to figure out what it is you are seeing and what it all means. A full-day boat tour on Inle Lake costs around $20 for one person. 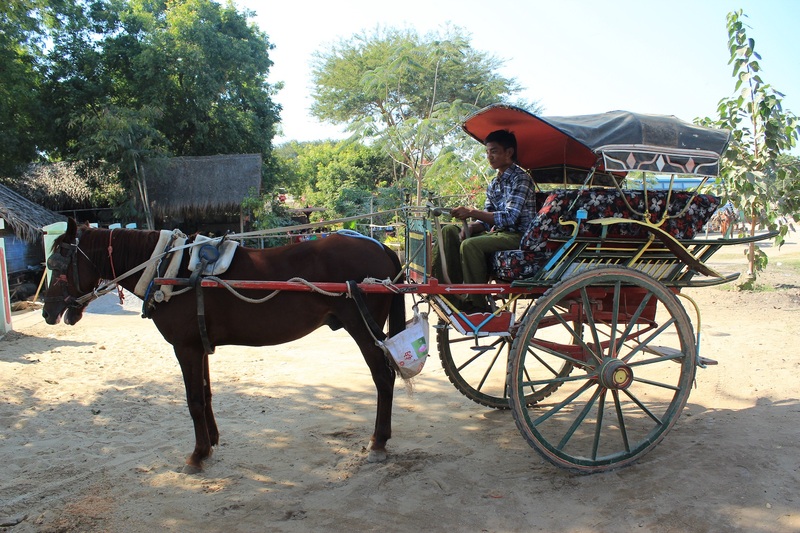 A horse-cart for a day in Bagan is also $20. Renting a bicycle is very cheap: $1.5 for the day. Electric bicycles in Bagan are $4 for half-day and $8 for full-day. Unlike Thailand where you can keep your socks on when visiting temples, Burma requires you to remove all footwear. You may want to carry moistened wipes to clean your feet between temples as the ground is not very clean. Burma’s currency is the Kyat (pronounced “chat”) and the exchange rate is a little below 1000 Kyats to the US dollar. There is no more black market and you can exchange your US dollars at the airport, or currency exchange booths, for similar rates. Dollars still need to be in perfect condition to be accepted. Some hotels want to be paid in $US, while some accept both currencies. 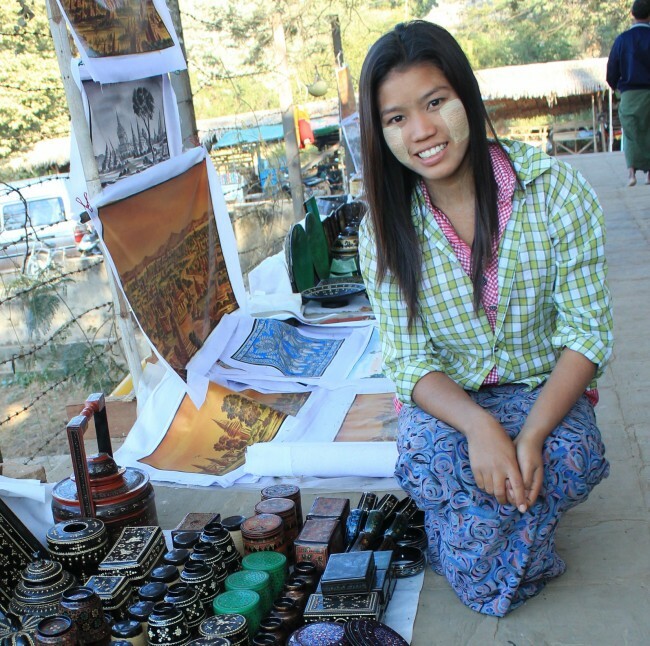 Entry fees to the Inle Lake area ($10) and Bagan ($15) need to be in $US. Taxis, buses and restaurants want Kyats. Make sure you have both currencies available. I saw ATM machines in all the main tourist destinations I visited, but didn’t need to use them as I had brought sufficient US dollars. If you plan on using the machines, bring more than one card, just in case (for example one card on the Maestro/Cirrus network and one on the Visa network). Do not assume you will be able to use your credit cards. Burma is very much a cash society. Laundry is billed by the piece, and not by kilo. For example a pair of pants may cost 500 Kyats to wash/dry, and a pair of socks 200 Kyats. For a week worth of laundry (1.5 to 2 kilos) I usually paid around $5-6. Laundry is dried in the sun (like in most of southeast Asia) so if the weather is rainy, you may not get your clothes back on the same day. Power is 220 watts, and all the outlets I saw accepted both flat North-American prongs, and European rounded ones. I never needed my adaptors. If your devices are not dual-voltage you may still need a power converter. Power outages are common, usually for a few hours at a time. You may not notice them too much as restaurants cook with gas, and hotels may have their own generators. Espresso machines and WiFi go down though! The internet in Burma is very slow, when it works at all. In Bagan I could not read my email for two days. Uploading photos to the web became almost impossible north of Inle Lake. Many budget hotels do not offer WiFi. Only pricier western-style restaurants have it, and even there, it is not reliable. Most staff just shrug when you complain about internet connections. Although everyone has a cell phone in Burma, not many people seem to use the internet. As a general rule, you cannot book your hotels, flights, or bus tickets online. You have to use travel agencies, or show up in person. Some hotels will take phone bookings if you are coming the same day or the day after and explain to them how you are coming, and when you expect to arrive. They may even send someone to pick you up. Since they have no way to collect a deposit, many hotels worry that you will not show up, or end up going somewhere else on arrival, leaving them with an empty room. There is no obvious method for booking hotel rooms. I booked a few through a travel agent (entire payment required in advance), one by calling them on my cell phone, one by showing up in person, and one by having my previous hotel call for me. If you have an unlocked GSM cell phone, you can buy a Burmese SIM card. I bought mine at a small shop selling cell phones near Sule Pagoda in Yangon for $25. It is valid for 30 days. You should consult your travel doctor and have your vaccinations up to date before you travel to Burma. Malaria is present in Burma in areas below 1000 metres (except in Yangon and Mandalay). Medical care in Burma is not of a very high standard. Buy medical insurance and don’t take useless risks. See also the CDC web site for Burma. Travel in Burma is a little more difficult than elsewhere in southeast Asia, but that shouldn’t faze out the experienced independent traveller. Although prices have risen, it is still many times cheaper to travel independently than to go with an organized tour. Having said that, having good guides (through a fully organized tour, or hired individually in each place) will certainly enrich the experience. I used the Lonely Planet Myanmar (Burma) guidebook throughout my trip. This information was accurate as of January 2014. If you want to pick my brain about Burma, you can find me on Plansify. Why are you using US dollars for your travels? Your Canadian? US currency is the most easily exchangeable in Asia and Latin America. Canadian dollars may not be accepted at all in many of these countries or fetch an inferior rate. For better or worse, the US dollar is still king!